Snow Crash is Neal Stephenson's breakthrough cyberpunk novel. 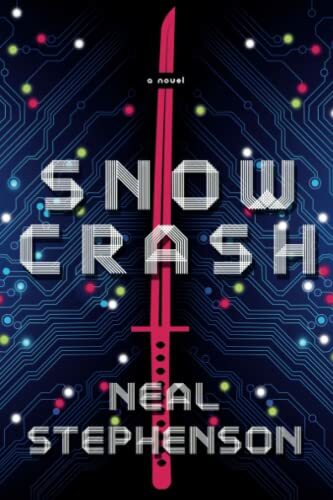 A breakneck-paced 21st-century novel, Snow Crash interweaves everything from Sumerian myth to visions of a postmodern civilization on the brink of collapse. Faster than the speed of television and a whole lot more fun, Snow Crash is the portrayal of a future that is bizarre enough to be plausible. Not-too-distant future - a world where the Mafia controls pizza delivery, the United States exists as a patchwork of corporate-franchise city-states, and the Internet - incarnate as the Metaverse - looks something like last year's hype would lead you to believe it should. In reality, Hiro Protagonist delivers pizza for the CosaNostra. But in the Metaverse, he's a warrior prince, last of the solo hackers, and the greatest sword fighter in the world. Now, he's racing along the neon-lit streets, the skirts of his black leather kimono flapping, on a search-and-destroy mission for the shadowy virtual villain threatening to bring about infocalypse! When his best friend fries his brain on a new designer drug called Snow Crash and his beautiful, brainy ex-girlfriend asks for his help, what's a guy with a name like that to do? He rushes to the rescue. Awesome story, highly recommended by me If you like scifi don't miss it. The game 'Deux Ex' is partly based on the books by Neal Stephenson. It was indexed on this html page with 463 other Audio Books titles. Open the page and browse the list, click a link to download in ed2k. .. and here is a torrent for this one also. The torrent is the same, the extra links are for backup.